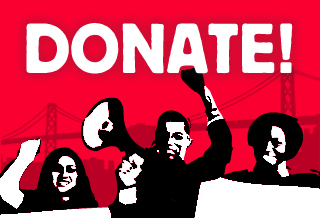 SAN FRANCISCO– A broad coalition representing over thirty community, labor, senior, and civil rights organizations from across San Francisco will gather at City Hall at 12:30 to support legislation to upgrade and significantly strengthen protections against evictions. The proposed legislation, sponsored by Supervisor Jane Kim and co-sponsored by Sup. David Campos, Sup. John Avalos and Sup. Eric Mar will address a surge of evictions. According to reports by the City’s Rent Board, the number of eviction notices served on tenants has increased over 67% since 2010. “We are facing an eviction crisis,” says Maria Zamudio of Causa Justa: Just Cause, a grassroots organization with offices in the Mission District. “We need action now to stop the destruction of our communities. · Requiring that eviction notices include translated information for tenants to get help. “This is the year’s most important tenant protection measure to be considered by the Board of Supervisors,” said Scott Weaver of the San Francisco Tenants Union. Speakers at the briefing will including seniors and families facing evictions, members of the Board, and community and labor leaders. The Board’s Land Use and Transportation Committee is scheduled to consider the legislation at its hearing following the briefing.